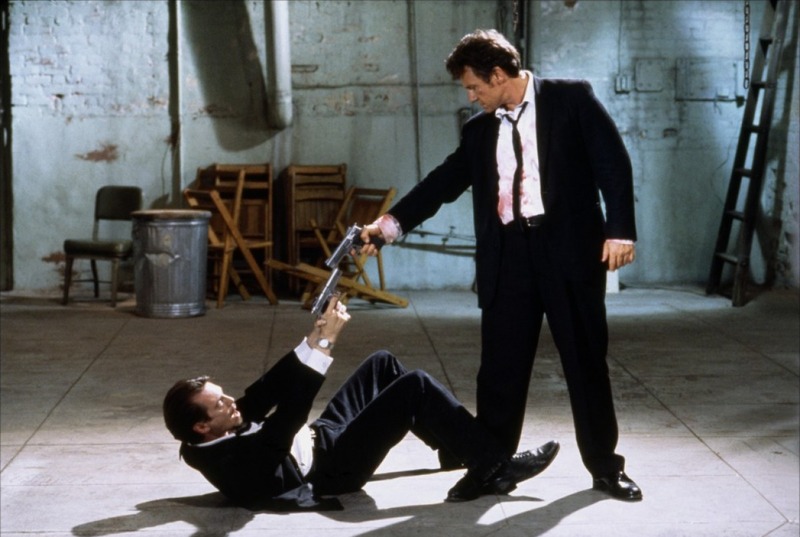 A violent crime drama, Reservoir Dogs introduced Quentin Tarantino to the world and unleashed stunning levels of profanity and violence in a tight independent production. After a seriously botched off-screen jewelry store hold-up that ended in a wild shoot-out with police, a group of gang members who only know each other by pseudonyms convene at a warehouse to regroup and recriminate. Mr. Orange (Tim Roth) has been shot in the stomach and is slowly bleeding to death. 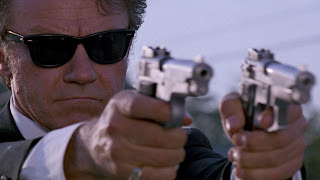 The veteran Mr. White (Harvey Keitel) feels responsible for Orange taking a bullet during the getaway. The excitable Mr. Pink (Steve Buscemi) is unhurt, having shot his way out of the chaos and then stashed the prized jewels at an unknown location. Pink is sure that an informant double crossed the group. The cool and detached Mr. Blonde (Michael Madsen) is blamed for starting all the shooting, and White labels him a psychopath. In the melee Blonde has also managed to abduct a police officer (Marvin Nash), who may hold information about the double cross. The group was brought together by crime lord Joe Cabot (Lawrence Tierney) and his sidekick son "Nice Guy" Eddie (Chris Penn). Now Joe and Eddie need to clean up the mess and figure out what went wrong. With emotions running high among the group of armed strangers, sorting out who is responsible for what will not be easy. Tarantino's directorial debut is a stunning crime film, filled with sharp dialogue, intriguing characters, and a story that gradually reveals itself through clever use of flashbacks. The central heist that causes the carnage is never seen, as Tarantino prefers to make his 100 minute compact film about people rather than events. The gang members are all strangers to each other, and the film is as much about a bunch of criminals getting to know each other and not liking what they uncover, as it is about the audience enjoying the experience. The film is mostly set at the one warehouse, and stylistically Reservoir Dogs resembles a stage play on steroids. Most of the action is through intense, threatening dialogue exchanges, with guns being drawn and bullets flying at strategically timed intervals. There are numerous highlights, including several red mist Mexican standoffs, not all of which successfully de-escalate. 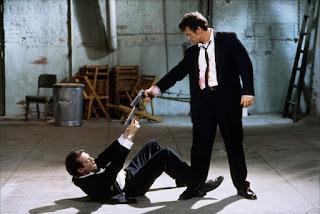 Tarantino's staging and choice of perspective is often audacious, never more than when a character is shot and falls to ground long seconds later, after the camera has seemingly lost interest only to catch a crucial glimpse. Oozing Blues Brothers-type cool in black suits, thin neckties and old-fashioned shades, the cast have a blast. The performances are excellent, with Harvey Keitel, Tim Roth and Michael Madsen particularly impressing. Keitel brings surprisingly prominent principles to Mr. White and Roth delivers most of his role from the ground and flat on his back. Madsen is a vision of understated insanity, a man so far on the edge he alienates hardened criminals. The violence and profanity are legendary. The thugs basically converse through streams of expletives and insults interspersed with a just the few non-profane words. Appropriately, Reservoir Dogs is male-only territory, and the film features no talking parts for any women.When it comes to blood and gore Tarantino also does not hold back, with messy bullet wounds and large puddles of blood literally painting parts of the set a bright red. But the peak of depravity is a torture scene not for the faint of heart, as Mr. Blonde reveals his inner derangement dancing to radio tunes while administering some impromptu butchery. At this reservoir, the dogs bark, bite, bleed and back stab, and all are off leash.